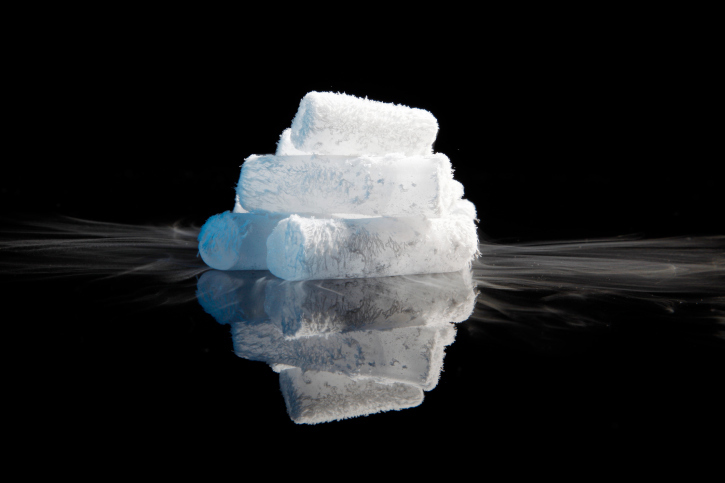 How much do you know about the history of dry ice? We love dry ice. That’s no secret — we’ve made it our livelihood. Last week on our blog we learned about how dry ice works, but where did it come from in the first place? Did cavemen use dry ice to keep their food fresh? Was it brought back from the future? No, neither of those are true. Let’s dive into the real history of dry ice, shall we? Historians agree that dry ice was first observed by a French chemist named Charles Thilorier in 1835. Legend has it that he was simply observing liquid carbon dioxide in a metal canister, watching it evaporate. After evaporation, he noticed a solid block of dry ice at the bottom of the container. From then, for the remainder of the 19th century, it was observed in labs but went without practical application until 1897. In 1897, an Englishman named Herbert Samuel Elworthy received a patent for solid carbon dioxide that he used to create soda water for his whiskey. The equipment he had available at the time was fairly cumbersome in this process, and few people used this technique. The first commercial use of dry ice in the US happened in 1925, thanks to Prest Air Devices.They had the idea of containing and compressing CO2 and attempted to sell compressed air solutions like tire pumps, grease guns, and creating soda water at home. The only successful product they created was the very first CO2 fire extinguisher. They were also able to sell their solid dry ice product to railway companies as a cooling alternative to regular ice, which took hold in the railway industry in 1932. Dry Ice Corp is the largest regional supplier of dry ice products and customized delivery services in the Northeastern United States, from Virginia all the way up to Maine. And because our dry ice is supplied by manufacturing plants located right here in the Northeast, we can guarantee freshness. Other suppliers, meanwhile, get their dry ice from manufacturing plants as much as 1,000 miles away, which has a direct impact on product freshness. Ready to get your dry ice? Click here! If you have any questions about using Dry Ice to ship seafood, please contact Dry Ice Corp by calling 201.767.3200. You can also connect with Dry Ice Corp on Facebook, Google+, Twitter, and Pinterest. This entry was posted on Friday, March 18th, 2016	at 1:23 PM	and is filed under Many Uses of Dry Ice	. You can follow any responses to this entry through the RSS 2.0	feed. Both comments and pings are currently closed.